Polar Umbrella: Ice Sheet Regenerating Skyscraper Wins the 2013 eVolo Skyscraper Competition! 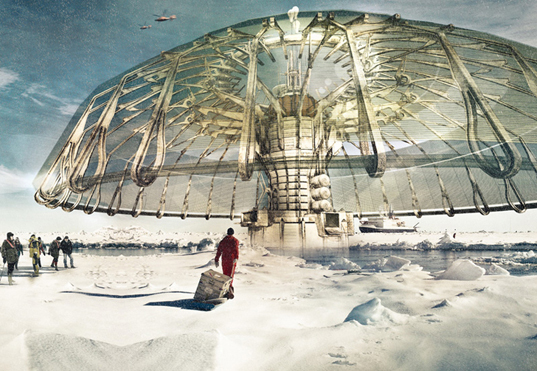 The Polar Umbrella super-structure is a buoyant skyscraper designed to rebuild the shrinking polar ice sheets affected by global warming. 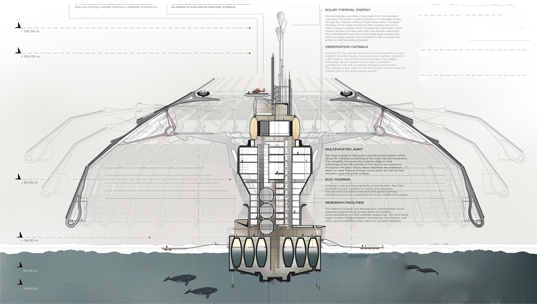 The project, designed by Derek Pirozzi, is a giant floating canopy that prevents the melting of Arctic and Antarctic ice while harvesting solar energy. The curiously-shaped design, which is based on osmotic technology, was awarded first place in the eVolo 2013 Skyscraper Competition—an annual contest that investigates the future of tall buildings. Research shows that the polar ice caps have melted faster in last 20 years than in the last 10,000. Polar regions have experienced dramatic melting trends which are responsible for a fifth of the global sea level rise since 1992. Pirozzi’s Polar Umbrella seeks to address these issues and offer a solution that reverses the harmful consequences of global warming. The umbrella uses salt water as a source of renewable energy generated in the centrally positioned facility which uses osmotic technology—diffusion of fluid through a semipermeable membrane. Solar power is retained within an umbrella-shaped membrane which deploys its thermal features and a special polyethylene piping system to process waste water. By recycling the water, the structure transforms it into a new resource that harnesses thermal gain from the membrane and prevents the heating of the ice below. With wildlife habitats, housing units and eco-tourist attractions, the proposal is a self-sufficient metropolis. As it navigates the polar water in its mission to cool the Earth’s surface, this futuristic city produces enough energy to sustain all its functions. The structure travels to the most affected areas where global warming caused the most damage to the Earth’s protective ice cover, reconstitutes layers of ice and moves on to other locations. This year’s eVolo Skyscraper Competition was complimented with a luxurious collector’s edition of the “eVolo Skyscrapers” book, a 1300-page publication which features 300 of last year’s best skyscraper proposals. The book is in limited circulation of only 150 copies. Pirozzi’s Polar Umbrella seeks to address these issues and offer a solution that reverses the harmful consequences of global warming. The umbrella uses salt water as a source of renewable energy generated in the centrally positioned facility which uses osmotic technology- diffusion of fluid through a semipermeable membrane. Solar power is retained within the umbrella-shaped membrane which deploys its thermal features and a special polyethylene piping system to process waste water. By recycling the already processed water, the structure transforms it into a new resource that harnesses thermal gain from the membrane and prevents the heating of the ice below. With its wildlife habitats, housing units and eco-tourist attractions the proposal is a self-sufficient metropolis.
. As it navigates the polar water in its mission to cool the Earth’s surface, this futuristic city produces enough energy to sustain all its functions.